Inform your production and media decisions with real time advertising measurement from ABX through syndicated or custom products. Move media investment from low-performing creative to high, optimizing advertising ROI and ROAS by at least 20%. 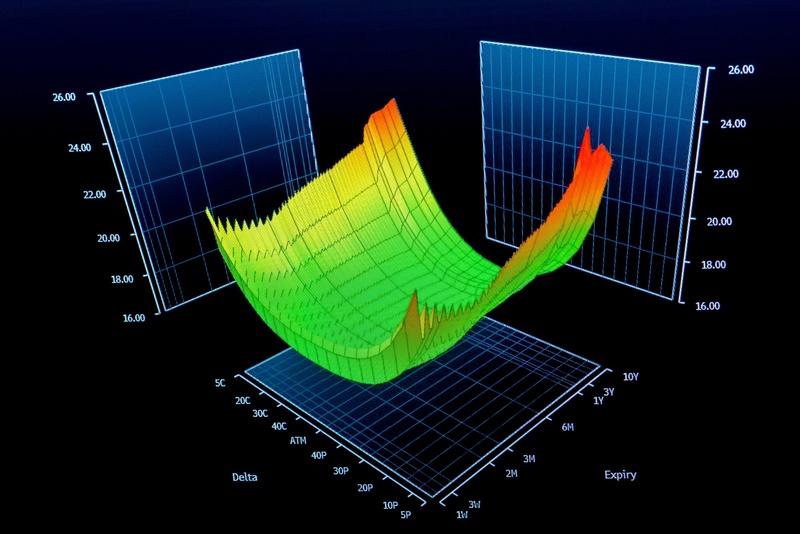 The ABX Index is proven to correlate to outcomes and improve marketing mix modeling by up to 15%. ABX provides 14 KPIs including a new ABX Gender Equality Index ™ that gauges unconscious gender bias in ads, with a new Multicultural Equality Index to debut this fall. For a FREE Monetization Estimate of how much money you can reclaim in your marketing budget through the ABX method, click the link. "My firm recently teamed up with ABX to compare the effects of media buys against creative effectiveness scores on sales revenues for one of the world’s largest health & beauty brands. ABX's creative scores across all media types for a 30-month period were integrated into the model. The results were profound (below) and showed that creative counts for 60-80% of advertising success." For more case studies, see this ABX Resources Page. In the ideal world, spend on an ad-by-ad basis would align perfectly with ad sales lift, but in this HBA brand case study, it does not with an R=.1138. The true situation is most often highly inefficient and wasteful! 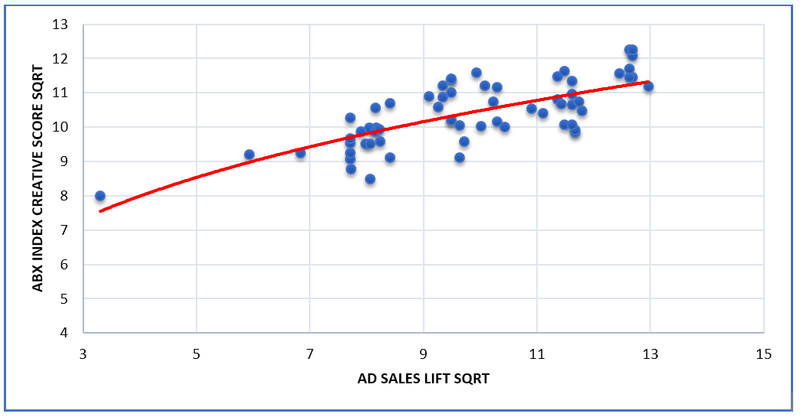 As we see to the right, the correlation between the media spend and sales lift had a very low correlation. A very low ROAS. 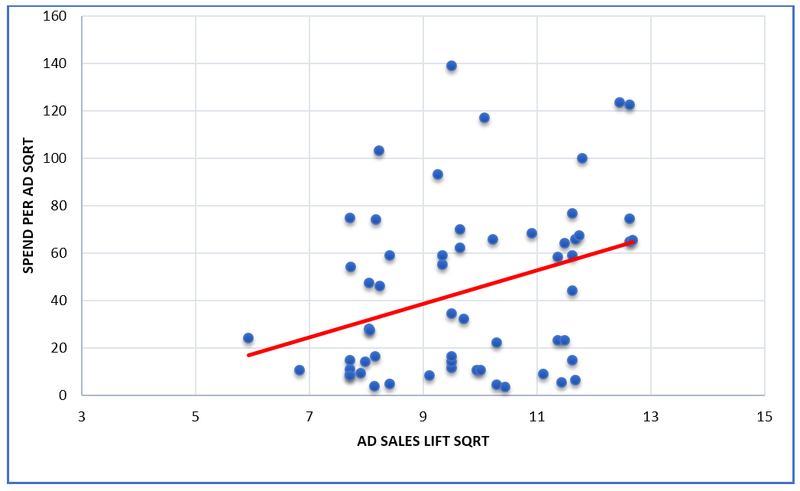 The ABX Index has proven to align and correlate extremely well with individual ad sales lifts. This provides a great resource for allocating marketing funds across individual ads at a very high correlation of R=.745 and advertising ROI! Using the ABX Index to allocate media budget by ad would have generated + $21 million in incremental revenue for this major HBA Brand. So creative effectiveness definitely drives sales, whereas media spend is a much weaker driver.